Hand pierced Summer and Winter Caddy Spoons. 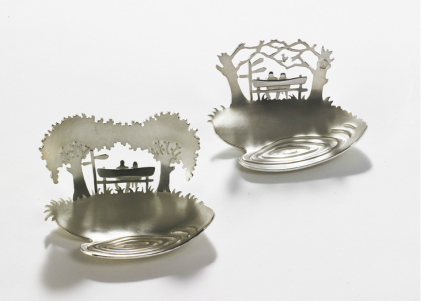 These romantic spoons create a scene of a couple sitting on a bench by a lake in a park. Notice the ripples of water in the bowl of the spoon. For more information on these Summer and Winter hand cut caddy spoons or if you would like to commission a particular theme or design please contact Jen.